Some people would rather not use the “E” word loosely here in Baltimore. But we’re not talking Joe Flacco. 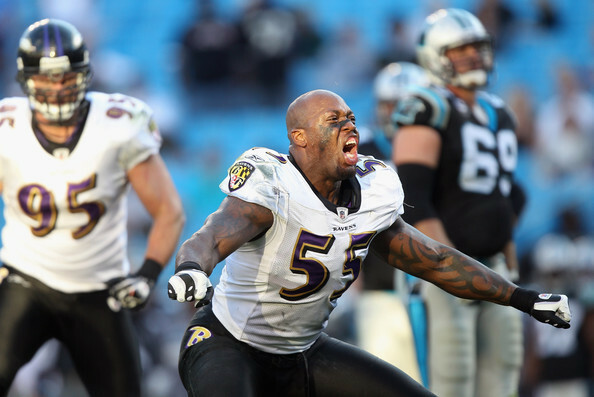 Today we spotlight Terrell Suggs fresh off a hat trick sack performance in the Ravens 26-23 victory over Miami. His three sacks of Ryan Tannehill give him seven on the season and puts Suggs on pace for 22. That warrants elite status in my opinion. Suggs is an early candidate for defensive player of the year and it would be Suggs’ second honor should he be awarded it. You have to call the 11-year veteran elite then because he would join some elite company. Joe Green, Mike Singletary, Bruce Smith, Reggie White, and Ray Lewis as the only players to win the coveted award twice, while Lawrence Taylor remains the only player to win it three times. Terrell Suggs already has half as many sacks as he did in 2011 (14) when he won the award, joining Ray Lewis (2000, 2003) and Ed Reed (2004) as the third Raven to win DPOY. The standout stat from that season was seven forced fumbles to go along with two INTs. He has yet to notch one of either yet this year, but the season is young. 50 members of the AP vote for the winner, and it’s important to have your best games in primetime, like when he notched three sacks of Alex Smith in Harbaugh Bowl I on Thanksgiving night. Suggs’ feasts on the Steelers (16.5 sacks in 18 games) and he’ll get them this year for a turkey day feast. Not to mention two late season primetime matchups with the Lions and Patriots. Terrell Suggs ranks fourth in the league in sacks behind Robert Mathis (9.5) Justin Houston (8.5) and Mario Williams (7.5). Despite his three sacks on Sunday, Suggs pass rush productivity dropped from 13.5 to 12.4 because the three sacks were the only pressure he created on the day. Over 12.0 PRP is still very good. In 2011 he posted a 9.6 PRP. Suggs is the best in the league among 3-4 OLBs at shutting down the run game with a Run Stop % of 14.7, while missing just one tackle this season. His Stop% in 2011 was 6.9. On the rare occasion where Suggs might find himself in coverage, what should be a mismatch for an offense with a LB covering a big TE or speedy WR, quarterbacks won’t even look his way. Suggs has dropped into coverage 14 times this year, with QBs targeting his man zero times. You would think if Pro Football Focus with their advanced stats gave out the DPOY award, “Terr” might already be engraved on it. But for the media sake, he might have to let a QB test him so he can make an INT or two. Let the old school/new school analytics debate begin.